It never ceases to amaze me that even the most seasoned and esteemed numismatists do not understand how United States coinage goes from manufacturing to circulation. The U.S. Mint does not distribute circulating coins to any United States bank except the Federal Reserve. At the end of every production line is a two-ton bag made of ballistic materials that collect every coin produced on the line. When the bag is full it is sealed and later transported to a processing center designated by the Federal Reserve. The U.S. Mint is a manufacturer. When they complete making the product, it is packaged in bulk and the customer, the Federal Reserve, picks up the product. Once the product is delivered to the client, that product’s distribution is no longer in the U.S. Mint’s control. During the time of the 50 States Quarters program, the U.S. Mint had an agreement with the Federal Reserve to distribute the new coins first in order to get them into circulation. When the new coins were transferred to the various Federal Reserve cash rooms in the 12 districts, the Federal Reserve did circulate the new coins first. What gets left out of the discussion is the logistics of transferring the coins from the cash rooms to the banks. The Federal Reserve does not deliver. Like many government agencies, the Federal Reserve relies on contractors to carry out that job. The Federal Reserve “sells” the coins to the logistics companies that bag and roll the coins and eventually deliver the coins to in armored vehicles to the banks. In order to save money, these logistics companies keep their own supply of coins. This supply comes from the Federal Reserve cash room operations or excess they are given by the banks. Sine the logistics companies were not part of the deal that the U.S. Mint made with the Federal Reserve, a bank that asked for a delivery of quarters may have received quarters from the logistic company’s stock rather than new issues from the Federal Reserve. Logistics is the coordination of complex operations and it is the job of these logistics companies to fulfill the inventory needs of the bank in the most efficient manner possible. It was more efficient to supply the banks in less densely populated areas with coins from current stock than transporting large amounts of coins from one of the Federal Reserve cash room operations that may be hundreds of miles away. The U.S. Mint may do many things that collectors might take exception to, but the distribution of circulating coins is not their responsibility. Coin image courtesy of the U.S. Mint. What would it take to put together a modern type set? How would you define a modern type set? This is the summary of the email conversation I have been having with someone looking for an interesting challenge to work on with his children. For new readers and those new to numismatics, a type set is one coin of every type regardless of date or mintmark. Although some coins have one-year types, like the 50 State Quarters, there are others where one coin will represent an entire series, like the Roosevelt Dime. While there are a lot of interesting coins types we focused on modern coins. Modern coins are those struck since 1965 when coins went from silver to copper-nickel except for the Kennedy half-dollar that was made of 40-percent silver through 1970. To budding young numismatists, modern coins are all they know. In fact, all they know is that the quarter has a constantly changing reverse and they have seen differences in the Lincoln cent and the Jefferson nickel. They did not go through the fiasco of the Susan B. Anthony dollar or marvel at the first circulating commemoratives of the modern era: the dual-dated bicentennial coins. They were not around to search boxes of Cheerios for the new Sacagawea dollar coin or the millennial cent. Modern coins do not get the same love as some of the classics. Aside from not containing silver, there have been controversies over designs (see the “spaghetti hair” that George Washington was sporting on the 50 State Quarters) and how the relief on coins has been lowered by the U.S. Mint in an attempt to extend die life. Although people love the classic designs two of my favorite designs of the modern era is the Drummer Boy reverse on the Bicentennial quarter and the Thomas Jefferson portrait on the obverse of the 2005 Westward Journey nickels. And even though I have not written much about them, there are some fantastic designs in the America the Beautiful Quarters series. A few that you may want to take a second look at include 2017 Ellis Island, 2017 George Rogers Clark National Historic Park, 2016 Shawnee National Forest, and the 2015 Blue Ridge Parkway quarters just to name a few. Sitting with a Red Book, I started to list the coin types that would make up a modern type set. If we limited the set to circulating coins (e.g., not including half-dollars and one-dollar coins) that can be found in pocket change, there would be 128 coins with a face value of $28.97. to learn more when they have access. Photograde is very useful to help them assess the condition of the coins. While collectors have a basic understanding of coin grading, getting it right can be difficult. These kids were given a basic lesson on things to look for when trying to assess the condition of the coins they find. It will be interesting to see how they interpret this information. Once we covered coins that can readily be found in circulation, we then discussed the other business strikes that are usually not found in ordinary pocket change. After an interesting discussion, it was decided to make those a separate collection. As a separate collection, this will give the kids an opportunity to go to dealers and coin shows to allow the kids to learn about buying coins in this environment. They will learn how to talk with a dealer, gain experience negotiating, and do some comparison shopping. It will let them get the experience and see different coins but maintain a collection discipline that will allow them to learn to collect on a budget. To complete the task, I came up with a checklist for all of the modern coins in two formats. One is a printed version that they could keep in their pocket as they go about their day. The other is a spreadsheet that can act as an official record. The paper version is a very basic PDF file that can be used to write notes. The spreadsheet offers more information. It also allows them to come up with their own catalogue. Both files are attached for you to use (see the Creative Commons Attribution-NonCommercial-ShareAlike 4.0 International License for text of the permissions granted with this release). It will be interesting to see what these kids do! The start of the new year was met with a lot of work. While I should be happy to be busy, I would like some time to continue to write this blog. It is relaxing and I enjoy sharing my numismatic experience, thoughts, and other stories with my readers. I thank you for reading and hope to pick up the pace on my writing soon. For now, here are a few short items that have been on my mind. Starting the last week of the year, I have been seeing more of the 2009 Lincoln Bicentennial Cent in circulation, particularly the Formative Years or Log Splitter cents. During one shopping trip, a cashier opened a new roll of cents and included three new Log Splitter cents in my change. I have also been seeing a few of the DC and Territories Quarters. Most of the quarters I have received in changed honor The Northern Mariana Islands. Its distinctive latte stone makes it very distinctive to notice at a glance. Interestingly, I have yet to receive a DC Quarter in change from stores in the DC area. The US Mint has released the new Native American $1 Coin. This year’s theme is “Government–The Great Tree of Peace” featuring five bound arrows and the Hiawatha Belt. The design looks much better in hand than in the images I have seen, even those from the US Mint. It must be the gold color of the manganese, but the design seems to have a bold yet artistic feel that the US Mint should consider submitting for the next Coin of the Year competition. Over the past few weeks I have read a few interesting numismatic books that I would like to report on. One of those books is Fascinating Facts, Mysteries & Myths About U.S. Coins by Robert R. Van Ryzin. I thought it was pretty good book but I have a caveat that I will report on in the near future. It seems that numismatics is one of the last industries to fully embrace technology. There have been some advancements that I want to talk about. One of them are the electronic books by Krause Publications. Whether you download their information or purchase a CD or DVD of their books, the people at Krause have taken an interesting step into electronic publishing. Also, some have also embraced the iPhone as a platform for bringing numismatic information to the masses. I recently downloaded a numismatic-related iPhone application that I will write about after I crash it a few times! As an aside, I am going to use my new 27-inch iMac to write a few iPhone applications of my own. Stanford University has a course teaching how to program the iPhone. The course is available through the iTunes store and sample code from the course’s website. I hope to use what I learn to create my own apps. I also hope that other readers who have a technical background and access to an Intel-based Mac to follow along with the course and create other apps for numismatists. I hope everyone had a good holiday season. Now let’s get to collecting! It was a desperate act during a desperate time. It was the winter of 1776 and the Colonial Army was looking for something to give it hope that they could beat the British who occupied Boston, New York, and Philadelphia, the most important cities of the time. Something had to be done. To restore faith in the Continental Army, General George Washington devised a plan to attack the Hessian forces in southern New Jersey that were helping protect an advance onto Philadelphia. General Washington know that the Hessians, German soldiers employed by Great Britain, were hearty partiers and would be doing so on Christmas. He devised a plan to cross the Delaware River at night to surprise the Hessians. On Christmas night, Washington lead 2,000 troops across the icy Delaware River undetected by the British. They regrouped on the New Jersey side of the river and marched to Trenton where the Hessians were camped. Two thousand hungry and cold colonial troops attacked the Hessian camp. After 45 minutes of fighting, the colonial forces has taken over 900 Hessians prisoner and controlled the camp. The soldiers found food, supplies, and much needed ammunition. A week later, the Colonial Army marched to Princeton and defeated the British army lead by Lt. Col. Charles Mawhood. Word of the success in New Jersey spread throughout the colonies and provided incentive for them to press on with the fight for independence. We may not know what it is like, but German-born artist Emanuel Leutze’s oil painting of Washington Crossing the Delaware is the image we most associate with the crossing. The iconic painting depicts General Washington on the lead boat with his foot on the bow as soldiers rowed across the frozen river. A flag bearer is standing behind General Washington who is being held up by another soldier. The darkened overhead sky to represent the night crossing with the sun rising in the east signifying the dawn of a new day in the revolution. On May 17, 1999, the US Mint introduced the New Jersey State Quarter, the third quarter of the 50 State Quarters program. The reverse of this quarter is engraver Alfred Maletsky’s wonderful interpretation of Leutze’s painting. Numismatics meets history as we remember the struggle for independence on December 25, 1776. Rick Snow, noted researcher of Indian Cents and die varieties, carefully examined the high-leaf and low-leaf varieties of the Wisconsin State Quarter. Although mainstream media stories have reported this as an accident, Snow analyzes the coins under an electron microscope in order to do forensic analysis. I am not sure if this is the “definitive answer,” but it is one of the better theories I have seen. After I posted a review of the DC quarter, I remembered that I had not posted what I consider the 10 State Quarter designs that best represents history and teaches us something about the state and our nation. These quarters may not be the best designs, but they represent a unique story about the state that makes it unique and contributes to the nation. Every one of the designs told a story of accomplishment and a proud heritage for the state it represents. I also learned something after each of these quarters were released. 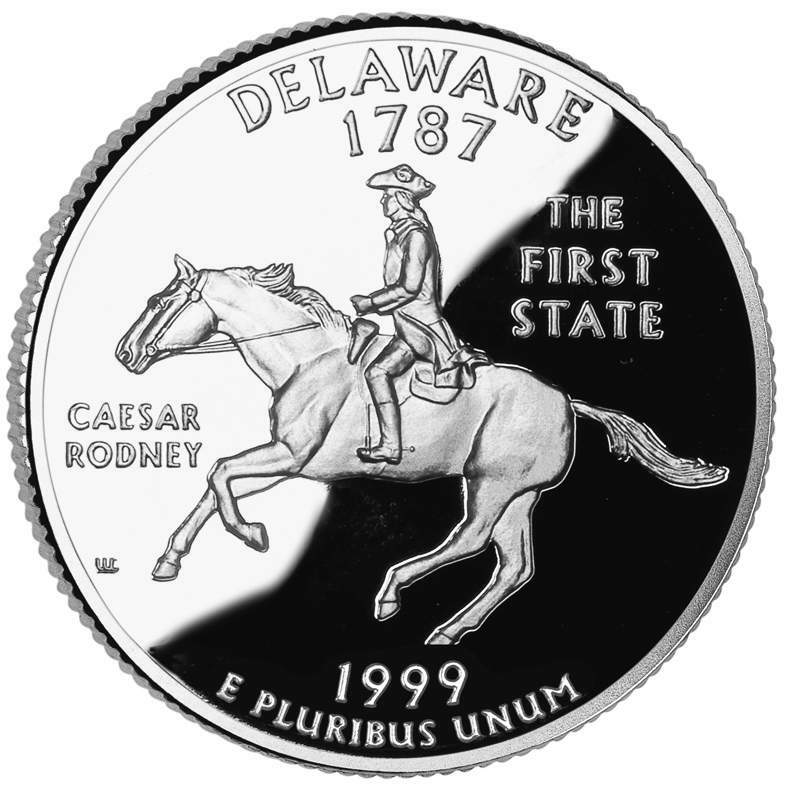 On the very first coin, I learned who Caesar Rodney was and why is he riding a horse on the back of the Delaware quarter. Rodney was one of Delaware’s representative to the Continental Congress. He was in Dover attending to other business when he learned that Thomas McKean and George Read were deadlocked on the vote of independence. Rodney rode 80 miles from Dover to Philadelphia to vote with McKean to allow Delaware join eleven other colonies voting in favor of independence. Rodney’s signature appears on the document representing Delaware and on the Declaration of Independence. Now that’s history! We learned in our history classes that General George Washington lead the revolutionary troops across the Delaware River in the middle of the night to surprise the English at the Battle of Trenton on December 26, 1776. In addition to George Washington, future presidents James Madison and James Monroe was part of the contingent. Rivals Alexander Hamilton and Aaron Burr along with future Chief Justice of the Supreme Court John Marshall were soldiers serving under Gen. Washington. The Battle of Trenton was a key battle that helped change the outcome of the war for independence. Although the Charter Oak appeared on the reverse of the 1935 Connecticut Tercentenary Commemorative Half Dollar, younger collectors probably have not seen the coin. Adding it to the Connecticut state quarter had me looking up the history of this tree. It was said that the colony’s charter was hidden in a cavity within the tree when James II sent a new governor to Connecticut to reclaim the document. One of the first “battles’ against the authority of the British monarchy. Jamestown, Virginia was the first permanent European settlement in the New World and would celebrate its quadricentennial in 2007. The design features the three ships that brought the first settlers to the new colony: Susan Constant, Godspeed, and Discovery. We are reminded of the beginning of this nation and how they came to the new land. Having visited Jamestown, I thought the design was exciting. On a cold, wind swept day on December 17, 1903, Orville and Wilbur Wright made the first powered, controlled, sustained airplane flight from the sands outside of Kitty Hawk, North Carolina—now the town of Kill Devil Hills. For three years, the Wright brothers lived in Kitty Hawk testing and perfecting their design that culminated in four successful flights on December 17. We may take flying for granted today, but this one event significantly changed history. The Corps of Discovery headed by Meriwether Lewis and William Clark that explored the Louisiana Purchase was an significant event that lead to the country’s western expansion across the continent. The trip ended in what is Oregon today. Amongst his party was his Indian guide Sacagawea and her baby Jean-Baptiste Charbonneau. The design shows Lewis and Clark’s return to St. Louis from their venture. It would have been easier for Iowa to create a quarter design based on its agricultural heritage. Instead, they chose to celebrate their education values demonstrated in their history. Basing the design on Grant Wood’s “Arbor Day,” the quarter shows a one-room school house with a teacher helping students plant a tree. When you learn that Iowa was one of the first states to organize their schools in county-based districts. Along with being amongst the first to form high schools, their experiences were adopted in other states. A subtle, yet important, historical note. On May 10, 1869, the Union Pacific and Central Pacific railroads officially completed the first transcontinental railroad. The completion was celebrated at Promontory Summit, Utah with the driving of the Golden Spike. Although there was one segment in California that was completed later, the transcontinental railroad provided significant economic development for the newly expanded areas of the country. When Governor Arnold Schwarzenegger announced that the design for the California quarter would honor John Muir, I had to go beyond my basic education as the who Muir was. I knew Muir was a naturalist and the founder of the Sierra Club. What I did not know was that Muir was instrumental in saving Yosemite Valley and Sequoia National Park. I also learned that Muir was widely published about ecology and proposed ecological programs that began to gain favor in the 1970s, more than 60 years following his death. Although he generated a lot of controversy, his concepts show benefits today. For teaching me about Muir, California’s quarter makes this list. Anyone who was educated in the United States knows the basic story of Abraham Lincoln. We know that he was the 16th president and issued the Emancipation Proclamation. We know he was the president throughout the Civil War and delivered the most remembered speech at Gettysburg, Pennsylvania. Lincoln was born in a log cabin in Kentucky and was assassinated at Ford’s Theater in Washington, DC. But I learned that Lincoln interested in the river and railroads. He holds a patent related to the buoying of vessels. I knew that he was the first Republican elected president but I did not know he was one of the party’s founders. There is so much more fascinating information that I learned about Lincoln that was never taught in school, but this is supposed to be a short paragraph. You should read some of the books about Lincoln. He is a fascinating person and what he did as president is the reason why he is considered our greatest president. This week, the US Mint released the quarter for the District of Columbia that honors Edward Kennedy “Duke” Ellington. The Washington-born Ellington was one of the most influential musicians of the 20th century with a career that spanned 60 years until his death in 1974. Ellington was awarded the Presidential Medal of Freedom by President Richard Nixon in 1969. Ellington was a great musician and musical ambassador. His music was very popular amongst the Washington society crowd in the early part of the 20th century. When his career picked up, Ellington moved to New York City to take advantages of opportunities. Ellington reinvented his career twice and was working on new projects when he died on May 24, 1975. Although Duke Ellington was a great musician and worthy of an honor, those who were involved with the District of Columbia quarter selection process missed an opportunity to properly honor the District and make a statement. Following the passage of the budget bill that contained the provisions for the DC and Territories Quarters program, then Mayor Anthony Williams appointed a committee to determine the design of the DC Quarter. When the design descriptions were submitted to the US Mint for approval, they included the phrase “Taxation Without Representation.” The phrase, which is on District license plates, is a protest noting that US citizens who live and vote in Washington does not have a representative in congress, who levies taxes and has veto authority over the city’s mayor. The Mint rejected the design as being too political. When the design was rejected, newly elected Mayor Adrian Fenty reconvened the committee to come up with a new design. Several designs were considered and put to a vote by District residents. The design honoring Duke Ellington won decisively. Unfortunately, the best option for the quarter design was considered. If the District government was serious about getting their message out about the lack of congressional representation for Washingtonians, they could have sparked the conversation by selecting a design that honored Walter E. Washington, the first elected home-rule mayor of Washington, DC. By doing this, congress has been giving the residents of the District of Columbia less rights and representation that any of the other states. Congress controls the District, its revenues, and its laws. Legislation passed by the city council and signed by the mayor has to be approved by a congressional committee before it becomes law. The Georgia-born Walter Washington was appointed as Commissioner of the District of Columbia by President Lyndon B. Johnson in 1967. His early years were marred with race riots and other issues that he had problems dealing with because of the restrictions placed on the appointed commissioner. After much lobbying, congress passed the District of Columbia Self-Rule and Governmental Reorganization Act of 1973 that allowed the city to elect its own government. Washington was elected as the first mayor of Washington, DC. If the District honored Walter Washington on its quarter, not only would it have been more appropriate from a historical perspective, it would have given the home-rule activists an opening to talk about their lack of representation in congress. People who have asked about this person on the quarter and they could have filled in the blanks. While it would not have been an overt message, it would have been subtle and shown intelligence with integrity. I like Duke Ellington but Walter Washington would have been a better subject. DC Quarter image courtesy of the US Mint. Image of Walter E. Washington from Wikipedia. After fifty different State Quarter designs, there has to be a few turkeys in the bunch. In this case, I call a design a “turkey” when it just turns me off. A bland design, disturbing images, and trying to do too much on a coin all qualifies as a turkey of a design. As I follow-up on my Best Quarters Designs, here is the count down to the ten worst 50 State Quarters designs from the 41st “best” designs. It is very disturbing to have the image of a dead animal on a coin. I do not care what it is supposed to mean to the people of Montana, putting the decomposed skull of a bison is just disturbing. Wisconsin deserves a better quarter design. This milquetoast design looks like someone was thinking about breakfast than Wisconsin. While the dairy from Wisconsin is necessary for a good breakfast, those who produce the dairy just deserve better. I love New York. I was born in New York. I still consider New York home. As a transplanted New Yorker, I hate the quarter’s design. I am not a fan of state outlines on the quarter because it really says nothing about the state other than “we’re here.” Then, the decision to put the Statue of Liberty on the quarter was made during a time that New York was arguing with New Jersey over ownership of the island making the decision for the design just dumb. Another state map trying to masquerade as a design. While the image of the Minuteman does depict Massachusetts’ place in the founding of this country, it would have been more fitting to find a design more fitting of this great accomplishment. When the Maryland quarter committee met, I was working on my Masters and taking care of a sick wife. But considering what could have been Maryland’s quarter design, the top of the capital is very lame. From the beauty of the Chesapeake Bay to the history of Fort McHenry, there is not a lack of good subjects. But the lame design was decided on by then Governor Paris Glendenning, who was Maryland’s worst governor since Spiro Agnew. Bad governor and a bad design. Another state outline and a trite reference to the one well known auto race in the state. There has to be something more to Indiana than fast cars. This would have been Indiana’s opportunity to teach us about their home. Instead, we get another state outline. This is another state outline with a twist: the hanging astronaut! With all due respect to Ohio, celebrating the “Birthplace of Aviation” with people whose accomplishment in Ohio is where they were born would be like calling Kentucky the Land of Lincoln. Further, poor John Glenn looks like he is hanging from Cleveland! He deserves better. Bad concept. Bad design. I will admit, I am not a fan of Texas. And I am not a fan of a former governor who‘se been living in public housing in Washington, DC for the past eight years. Maybe that is shading my view on the state and the obnoxious look of the star on yet another state outline. Did someone forget the Alamo? A jumbled mess of three untied images that had to have been decided by a committee because a fifth grader could have done better. I understand the concept to bring in the history of discovery that occurred in Florida. But even rough sketches with clouds and other elements did not work. They were better off sticking with oranges and alligators. My first impression of this design was “is this it or is this a cud?” Sure, the symbol is on the license plate, but maybe that is where this image should have stayed. Wyoming is the home of Yellowstone National Park and the Grand Tetons and a cud is the best they can do? I looked at the ten best and the ten worst. Next, I want to look at the ten quarters that either taught us something or reinforced something historic about the state. The end of 2008 is upon us which means that the 50 State Quarters program comes to the end. With the end of this program comes time for a review. It was a unique program, never tried in this scale by any mint. Regardless of any measure, the program was a success. After the release of the Hawaii quarter, the US Mint issued at press release noted that the netted nearly $3 billion in extra seignorage from the increased demand for the quarters. Another side effect of the State Quarters has been the increased interest in coin collecting. Although the mintage of the quarters dropped as time went on, many of the State Quarter collectibles saw sellouts at the Mint’s online catalog. 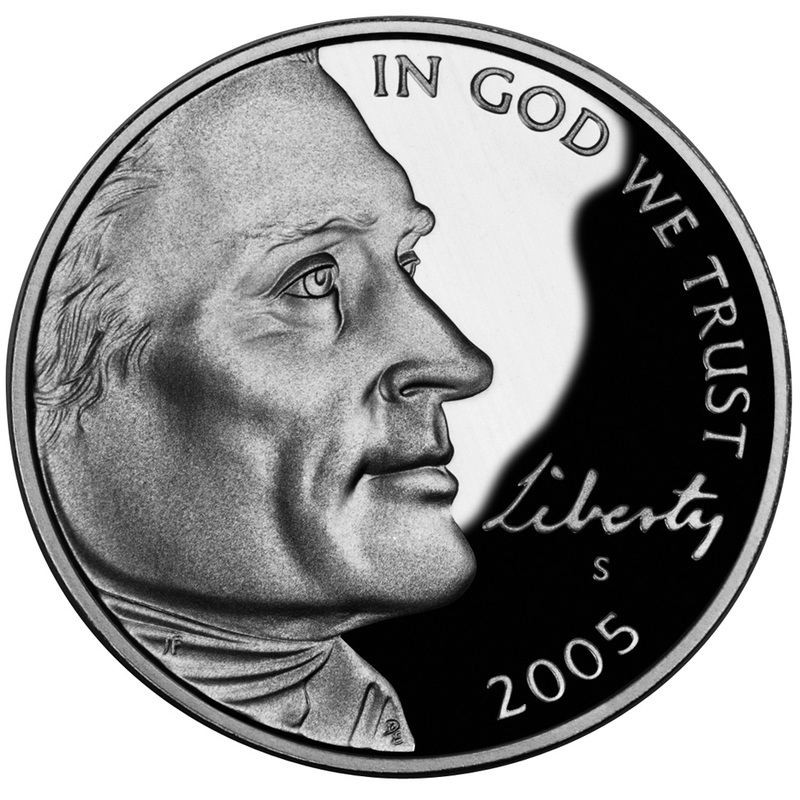 States used the program to get their citizens involved in the design of their quarter. Some states held design competitions while others appointed special commissions to find a representative design. After 50 different designs, there were some good designs, there were some bad designs, and then there were the designs that helped teach history. For the rest of this article, I will focus on what I felt were the ten best designs. I have to admit I love the concept of buffaloes on coins. I am a fan of the Buffalo Nickel and I think it is a uniquely American animal that is more representative of this country than any other animal. I like the design used on this coin. What’s better than one buffalo than a herd of buffaloes! Yes, two buffaloes make a heard. Donna Weaver treated us with a wonderful design that should be used somewhere else. The adaptation of Grant Wood’s “Arbor Day’ to honor Iowa’s place in promoting education is an example of how states should have treated their quarter designs. Mercanti executed an excellent design that Iowans should be proud to carry. 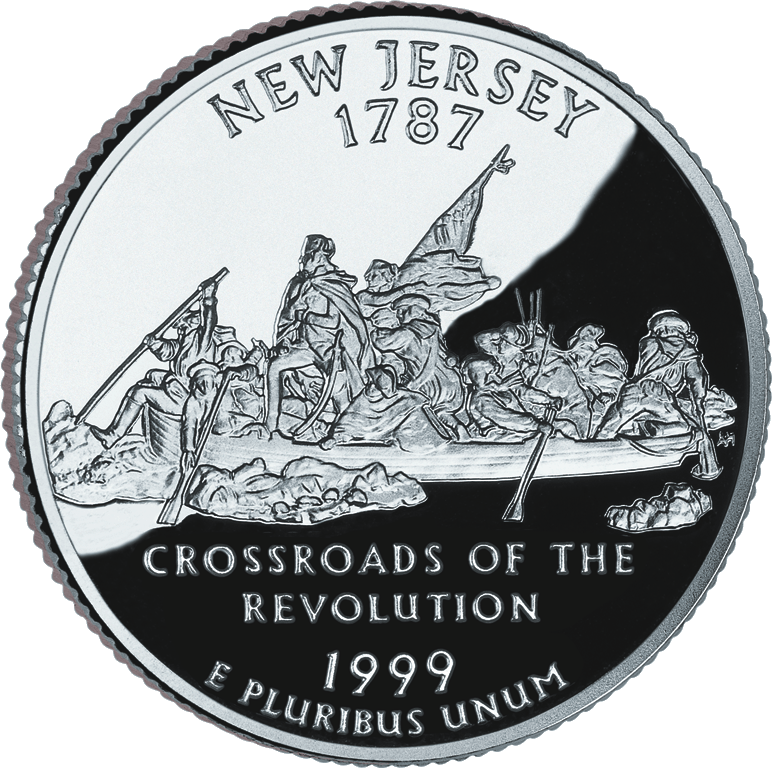 George Washington crossing the Delaware River to attack the British is a powerful story and makes for a powerful image on the New Jersey quarter. The details of the engraving show well on such a small coin. It would be interesting to see how Maletsky would execute this on a larger surface. If you have ever been to Maine, you would understand how the depiction of the Pemaquid Point Lighthouse with the schooner screams that it represents Maine. Weaver’s work reminds me of oil paintings of the area. There is a serene feeling of this image that is very appealing. Donna Weaver has to be one of the best landscape engraver at the Mint. Her take on Crater Lake, viewed from the south-southwest rim to include Wizard Island and Watchman and Hillman Peaks on the lake’s rim almost puts the us right at the lake on a calm sunny day. When the program started, there were a few states whose themes could be easily guessed. Utah was one of those states. Utah chose a design based on the meeting of the Central Pacific and Union Pacific railroads at Promontory to open the first transcontinental railroad. Even with the design’s predictability, the execution is very impressive. Maybe my bias towards history shows in this pick, but I really like the design of this coin. Animals are tough to ignore. Animals depicted in their natural habitat showing how the balance in nature works is also tough to ignore. Combine this with the skills of a master engraver and you have a wonderful work of art on a quarter. Vickers depiction of the grizzly bear catching the salmon is a phenomenal work of art and deserving of a Top-5 pick. There are some coin designs that look better in hand than its picture. Then there are those designs that look great in hand and phenomenal under magnification. Farrell’s engraving of the Charter Oak, the hiding place of Connecticut’s first constitution, is an amazing work of art, both in hand under under magnification. While it might be trite to use a magnolia for the Magnolia State, Donna Weaver produces yet another winner with her beautiful engraving of magnolia blossoms. Magnolias are beautiful flowers and this design does them justice. It is difficult not to smile and have pleasant thoughts when looking at this design. As you scan my list, you will notice that four of the designs were engraved by Donna Weaver. Weaver was a Master Engraver at the Mint who in 2006 to pursue other ventures (see her website at www.waxportraits.com). She continues to be involved with coin design as a member of the Artistic Infusion Program. Keeping her involved with coin design will benefit future Mint issues. Next, we will look at the the ten worst designs. As we end 2008 and look to 2009, numismatists are going to have a lot of options to add to their collections. There will be quite a number of coins that will excite many. But the shear numbers may be overwhelming to others. However you feel, the US Mint will have a very busy year. Let’s look at what is coming up in the new year. First, three coins will not see any changes. The “Return to Monticello” Jefferson Nickel introduced in 2006 will not be changed. Neither will the Roosevelt Dime, in circulation since 1946, and the Kennedy Half Dollar, as it has been since 1964 except for the Bicentennial issues. For 2009, we will celebrate the bicentennial birthday of Abraham Lincoln. In celebration, congress has authorized the 2009 Lincoln Bicentennial One Cent Program as part of Public Law 105-145. As part of this program, the Mint will issue four reverse design representing Lincoln’s birth and early childhood in Kentucky (1809-1816), his formative years in Indiana (1816-1830), his professional Life in Illinois (1830-1861), and an extraordinary presidency in Washington, DC (1861-1865). As part of the Lincoln Cent program, the US Mint will issue a 2009-S VDB non-circulating coin that will be struck in the .950 copper alloy used when the 1909-S VDB was first struck. Also, Public Law 109-285 was passed earlier this year that created Abraham Lincoln Commemorative Silver Dollar to round out the celebration of our 16th president. To round out the State Quarter program, 2009 will issue quarters to honor the District of Columbia and five US territories: Puerto Rico, Guam, American Samoa, the US Virgin Islands, and the Commonwealth of the Northern Mariana Islands. The DC and US Territories Quarter Program authorized by congress in an amendment as part of an omnibus budget bill at the end of 2007. The same omnibus budget bill also removed the motto “IN G-D WE TRUST” from the edge of the dollar coins. The amendment was introduced by Rep. Virgil Goode (R-VA) who was defeated for re-election. The Presidential $1 Coin Program continues in 2009 to honor presidents William Henry Harrison, John Tyler, James K. Polk, and Zachary Taylor. Harrison had the shortest term when he died one month into office after contracting the flu following his refusal to wear an overcoat during his two-hour inaugural address on a cold day in March, 1841. All of the packaging options with Presidential $1 Coins will not be offered in 2009 after not selling well the last two years. Along with the presidents, the First Spouse Gold Coins will be issued for Anna Harrison, Letitia Tyler, Julia Tyler, Sarah Polk and Margaret Taylor. Letitia Tyler was the first President’s wife to die in the White House. Julia Tyler became First Lady after marrying John Tyler in 1844. Native American $1 Coins program will begin in 2009 with a design honoring the “Three Sisters’ agriculture, in which corn, beans and squash growing in the same mound enhanced the productivity of each plant. It was a unique program that lead to the concept of crop rotation we know today. This change was authorized by Public Law 110-82 and add edge lettering to these coins. That brings the total number of circulating coins to 18! Proof sets will have 18 coins and the uncirculated Mint Sets will have 36 coins. Although the Mint has not announced pricing, it would be fair to guess that the prices will raise with more coins in the set. Clad and Mint sets should see a modest price increase. Silver proof sets will add an additional silver quarter and is likely to see a $10-15 rise in price. Beyond circulating coinage, the Mint will produce the 2009 Louis Braille Bicentennial Silver Dollar to honor the 200th anniversary of Braille’s birth. It is being touted by the Mint as being the first coin with readable Braille. Precious metals programs will change in 2009. First, only the bullion issues of the American Eagle coins will be strucl. The Mint has discontinued the collector’s uncirculated coin program, eliminating the W mintmark from their portfolio. American Eagles will be available in proof and bullion coins in one-ounce, half-ounce, quarter-ounce, and tenth-ounce denominations. American Buffalo 24-Karat Gold Coins will also continue in 2009 but without fractional issues. The Mint will offer only one-ounce proof and investor bullion coins. Last, but certainly not least, is probably the most intriguing coin that will be issued in 2009: the 2009 Ultra High Relief Double Eagle Gold Coin. The coin’s design will be a high-relief $20 gold piece on a double-thick, 24-karat gold planchet (sometimes called a piefort) 27 millimeters in diameter. The design will feature Augustus Saint-Gaudens’ original 1907 design where the date will be in roman numerals (MMIX). The inspiration for this coin came from 1907 when the Mint tried to strike an experimental double eagle coins using two stacked $10 eagle planchets. When the Mint’s management realized that congress would have to approve the striking of the coin for circulation, the project was abandoned and the test pieces were melted. Aside from the date, the only difference between the 1907 test pieces and the 2009 bullion issue is that the the motto “In G-D We Trust” will be added over the rising sun as it appeared in 1908. It is expected that these coins will be struck in proof-only varieties. It will be quite a year!